Whether you are new to driving or you have been doing it for decades, chances are you’ve been warned about the dangers of drinking and driving. Unfortunately, it seems no matter how familiar people are with the poor decision that is drunk driving, they still do it. Sure, it’s not the most convenient thing in the world to leave your car where you have been drinking and call a taxi, but let us tell you, it is worth it. As a law firm that represents many people who have been involved in car accidents that are caused by drunk drivers, we know the severe consequences that come with such a thoughtless decision. Continue reading below to learn more about the many horrible things that can happen when you get behind the wheel while you are drunk. You’ll likely end up in jail. No one ever thinks they will end up in jail, even more so when they are intoxicated. However, if you are caught drinking and driving, you can bet that jail is precisely where you are likely to end up. You may think that a night in the “drunk tank” doesn’t sound too awful, but in the instance that you end up hurting or killing someone during your reckless act, you may find yourself in prison for years. Your insurance premiums will increase. If you ever talk to someone who has gotten a DUI or DWI, they will undoubtedly tell you that they are paying a ton for their car insurance now. Drivers who have a DUI conviction are simply more likely than those who haven’t to get another one. Overall, they are just a higher risk for the insurance company to cover. This is why premiums increase once you have been convicted. You could lose your job or professional license. If you work in a number of different industries, a DUI conviction can lose you your job or cause you to have your professional license revoked. For example, if you are employed by a municipal or state government, are a doctor, teacher, lawyer, police officer or public figure, you run the risk of not having a job when you are convicted. You may have to pay very large fines or fees. Did you know that getting a DUI is extremely expensive? Not only do you have to pay for the cost of the ticket, but you also will likely be responsible for paying court fees and fines as well as civil penalties (if you damaged property or caused injury to someone else). Not to mention you will have to pay fees to have your license reinstated eventually. You could be in an accident. This may seem like a no-brainer, but when people are intoxicated, they often feel as though they are invincible. They don’t even consider the possibility that they could get into an accident that could take their own life or the life of an innocent person who was simply in the wrong place at the wrong time. You can end up with a criminal record. If you don’t have a criminal record, chances are you don’t want one and you certainly don’t want to get one for driving while you are drunk. This information could prevent you from getting your dream job, or really any job, in the future. You could injure other people. While you may think that you will be fine getting behind the wheel after a few cocktails, you could be taking more than just your own life into your hands. A fifteen minute drive while intoxicated could change the trajectory of your entire life if you are to injure or kill someone else while you are driving drunk. 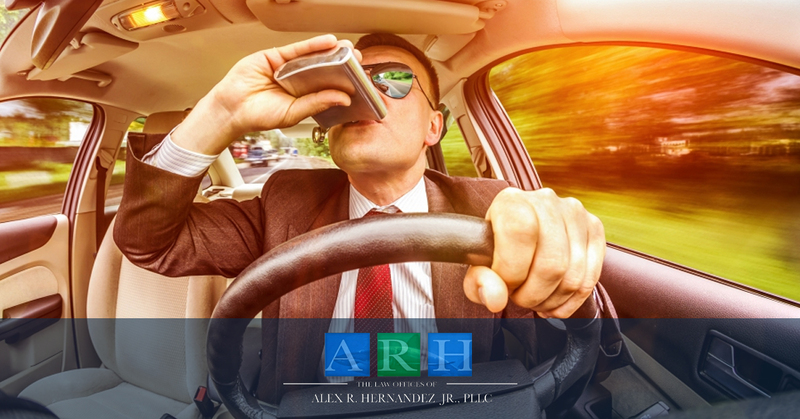 If you have been in a car accident caused by a drunk driver, contact the Law Offices of Alex Hernandez, Jr. today to learn more about how our talented legal team can help you. We may be able to get you the compensation you deserve from a personal injury lawsuit. We have helped plenty of people like you get what they deserve from people who were reckless and chose to get behind the wheel while they were drunk. We’re sure we can help you as well.